Many cookbooks come with their own history. I've told you about the little set of books that first introduced me to cooking from around the world. In passing, I mentioned the Oil and Vinegar cookbook, that I love. I have other cookbooks with stories. When I first moved to Halifax, I was Dan's tenant; I rented the little apartment in the lowest level of the house he owned. (That's a whole other story, which I'll probably tell you sometime.) We became friends very soon after we met and enjoyed spending time together. We both worked downtown and although I can't remember that we ever walked to work together (he left much earlier than I did), we occasionally met after work and walked home together. At the time, we were both members of a co-op bookstore called Red Herring. It was on the route home and, whether together or separately, we often dropped in to see what was new. One day, on my own, I was browsing the shelves in the cookbook section. It was getting close to Christmas and I knew Dan liked to cook — as I did. We cooked for each other from time to time, both upstairs at his place and downstairs at my place. That day, I saw the book that I knew was the perfect Christmas gift. Talk about enchanted. I was enchanted. 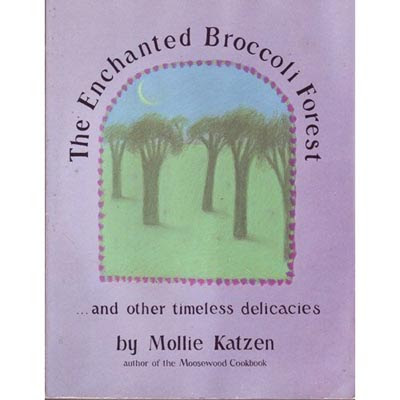 This was not a book I was familiar with but the very idea of the beautiful little stalks of broccoli that look like little trees anyway being described this way made the book irresistible before I even read the recipes. As luck would have it, Dan arrived at the store while I was still browsing but I managed to tuck the book away with other stuff I was carrying and I paid and smuggled it out of the store without him seeing it. The day before he was leaving to visit his mother over Christmas, we exchanged gifts. I was so happy with my choice but I could tell by his face when he opened it that he was uncomfortable. Sure enough, he already had the book. There it was, on his shelf, where I had never noticed it. Boo hoo. I kept the book for myself. Either his or mine is still on our shelf today — but yes, we only have one. The other is long gone, into a yard sale or sold off for some good cause. Of course, I've happily used the book over the years for its intended purpose but when I look at it, I can still get that sweet almost-romantic feeling I had that day in the Red Herring bookstore, when I really thought I had found the perfect gift. We pretty much stick with the basic recipe and we don't usually add the vinegar to this one. Just lots of minced garlic, chopped tomatoes, basil leaves, s&p and cubed mozzarella cheese. And so we'll have something green we often have a Caesar Salad on the side. But you had found the perfect gift - he already had it.